Find my UPDATED post of Christmas SINGO HERE. You can download 25 Singo sheets along with calling cards. I'm actually using this lesson NEXT Sunday as this week we're still practicing for our musical numbers in Sacrament Meeting (I've mentioned before there is ONE, and only ONE benefit to having Sacrament Meeting last). But I figure most need an actual lesson this Sunday and this is a great, low-key activity. 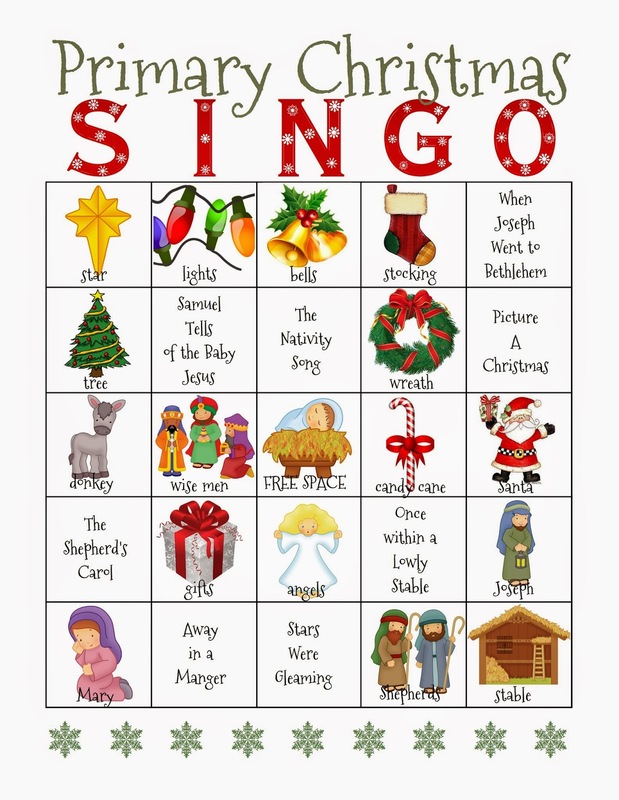 It's simply Bingo but I like to call it "Christmas Singo!" When a Christmas song is pulled, you sing the song. Find the website HERE and you can customize it how you want (I picked the 5x5 option). Title it "SINGO." There's also a customizable "Christmas - Religious" option and another option where you can add text instead of the pictures (I tried to replace some of the pictures that weren't as relevant like the cat and dog). Add all the Christmas songs your Primary knows, or even better, doesn't know! Introduce them to some of the songs in the Children's Songbook that are unfamiliar! I always post words and if you want, bring in the CD and everyone can then sing along. You can then refresh each page after you print and it generates a new card! I wish I had found this before I made my own!! Print them on card stock and throw them in plastic cover sheets. I prefer the cover sheets to laminating because first and foremost, it's cheaper; but mostly because I can toss in those little square pieces of paper (25 needed) to cover the squares as we play. When we're finished the kids just put them back inside. If you want to hand out a little treat to the kids, give them some M&M's or Skittles to play with and they can eat them when you finish. Not sure what to do when someone gets 5 in a row...thoughts? Maybe just a high five! Ha! Or, if you'd rather, a Chorister's Facebook member created her own and posted it. You can find the link HERE (you'll have to be a member of the group to get to the link). I always have the kids turn around and put their cards on their chairs while they kneel on the floor. When we sing, they just stand up and face the front. Keeps everyone moving. Now, for Junior Primary, the cards can be a little much. In the past, I've passed out sheets to the teachers only and the kids just kind of group around their teacher's sheet and they play against classes. I'm not sure I like the "Call out Sheet" the website generates. I'd probably just cut up a few bingo cards and make sure I have all the picture/songs and put those in a bag. Easier for the kids in my opinion. The color Red: The color red helps us remember that Christ shed his blood for us. Just a note, on the back of my Christmas Singo cards, I printed my "Primary Program Singo" game - just to save paper. You can find that HERE if you are interested. Thanks for being such fabulous readers and I'll see you all next year with some new and HOPEFULLY fun ideas for 2013!! I already have a few ideas for introducing our cute new sunbeams and the big handful of new teachers that will be joining us in January so stay tuned!! Thank you so much!! This is a wonderful resource. We'll be playing "SINGO" today in Primary! This is awesome camille! Can you tell me what songs go with the pictures?! Thanks! The pictures don't correlate to any song, more like fillers. You can elaborate on the picture as to why it is a Christmas symbol if you want using the list I have posted. Hope that helps! Thank you for this awesome game idea! I plan to do with my primary kids this sunday! I'm using this Sunday since it's the 5th Sunday and also because the Primary leaders are going to be busy getting things ready for the new year. I decided just to use a winter theme and then I'm going to enlarge the pictures from the call sheet, write the correlating song on the other side (any we've sung this year), and then have the kids choose which song they want to sing and we'll flip it over to see what picture correlates with it. We'll be using skittles as markers and should have a lot of fun! It'll be a great way to keep them entertained and provides lots of opportunity to sing :) Thanks for the idea and bingo site link! This is great! Will you have variations of the top version done by this Sunday? I want to play it this Sunday with my kids and I think your top version is definitely a lot cuter! I'm working on them now, will have them up on the blog by tomorrow :).